Panerai | 4'900 € Tax inc.
Officine Panerai is an iconic Italian watch brand founded in 1860 in Florence and known across the world for its strong luminescent properties and very recognizable case designs. After the Panerai Radiomir, the Panerai Luminor brought luminescence to the next level and the brand filed another patent to protect this innovation. Moreover, the Panerai Luminor watches are highly recognizable watches because of their cushion shaped case, but above all because of the particular round shape of the crown guard on the side of the case. In some rare cases, the crown and its famous round crown guard are even positioned on the left side of the case for functional reasons and to enable the wearing of other diving instruments on the same wrist, such as a depth gauge. The Panerai Luminor watch is available in a base model as well as in a Marina model. The Panerai Luminor base model is of minimalist design and features an hours hand, a minutes hand and large Arabic numerals at each of the four cardinal points as well as long, thin hour markers to fill-in the gaps between the numerals on the dial. The Panerai Luminor Marina differentiates itself from the base model through the small seconds indication positioned at 9 o’clock. The small seconds hand is an unmistakeable element of all the Panerai Luminor Marina watches. The power reserve of both the base and the Marina variations can vary between three days and 10 days. In the case of the base model (PAM 00372), the watch is equipped with a hand-wound mechanical movement. However, in the case of the Panerai Marina, the movement is generally automatic, features a small seconds hand at nine o’clock as well as in some occasions a small date indicator at 3 o’clock. The Panerai Marina Logo 3 Days Acciaio (PAM 00778) is part of the Panerai Marina collection of watches and one of the most successful Panerai watches. The Luminor Marina Logo 3 Days is a classic watch with a very recognizable style, positioned among the entry range Panerai watches. The Luminor Marina features a 44mm polished stainless steel case, which is where the “acciaio” terminology comes from. Indeed, acciaio is the Italian word for steel. Panerai has always stood out for its sleek, minimalist design and the Luminor Marina is no exception. The watch is elegant and functional, available with a white dial or with a black dial. The only decorative element on the dial of the watch is the famous inter-locked OP logo, positioned at 6 o’clock. The movement of the Officine Panerai Luminor Marina Logo 3 Days Acciaio is a manufacture movement. The P.6000 calibre is a hand-wound movement with a power reserve of three days, entirely produced by Panerai’s high quality watchmaking Manufacture in Neuchâtel, Switzerland. The balance oscillates at a frequency of 21’600 vibrations per hour. It is to be noted that the brand has evolved considerably over the years, moving from all external ETA base calibres to all internal manufacture movements. Long story short, Officine Panerai must either already sit on your wrist or be present right at the top of your whish list. The price positioning, the materials (gold, stainless steel, black ceramic), the strap styling (vintage leather or veal, steel, gold) and the wide spectrum of models available (Black Seal, Submersible, GMT, Marina, Acciaio, 8 Days, etc.) 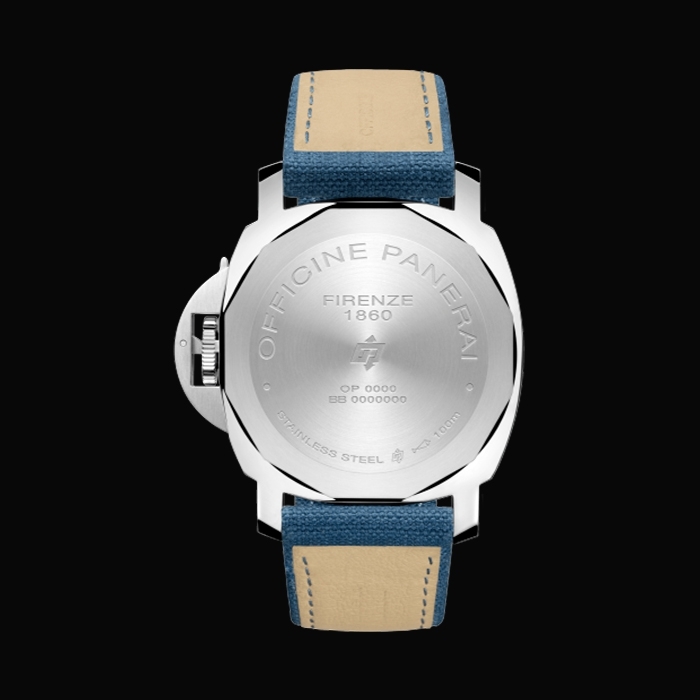 really leave you with no excuse to find your perfect Panerai model.